In discussions this side of the Atlantic, Pere Ubu often get painted as the American mirror or answer to the provocation of The Fall. It’s a comparison that makes sense on certain superficial levels – both bands emerged from the post-punk bloom with artistic visions strikingly divergent from their peers, and both have marched right into the present day under the leadership of a striking, authoritarian frontman. Truthfully though, the sound of Ubu is one with very little real precedent in rock music. David Thomas’s careering howl finds its source in Beefheart, yes, but Thomas’s pipes get put to very different use. The un-melodic, abstract electronic sound pioneered by original keyboardist Allen Ravenstine placed Pere Ubu in their own alien landscape (a tradition kept alive by current members Robert Wheeler and Gagarin, who provide a dual synth/electronic attack that pushes their music into some gloriously outré areas). They exist proudly outside of trends, stepping endlessly forward in their own off-kilter way. 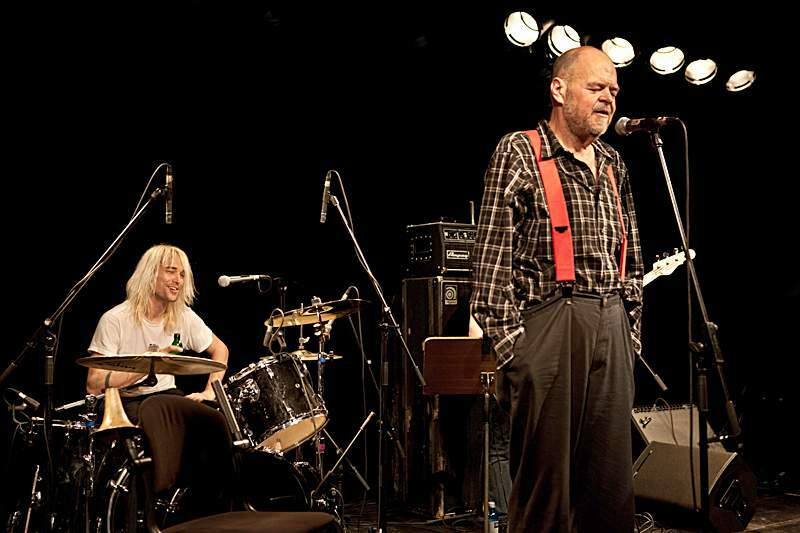 Tonight, the current Pere Ubu provides two sets, opening with a half-hour experimental performance as the Pere Ubu Moon Unit. Based on new work-in-progress material, this looser set shows off the superb chemistry this Ubu boasts. Now without a bassist, the band is able to drift and bleed into new areas with ease, but between the constant direction of the seated David Thomas and the crucial interventions of clarinettist Darryl Boon (whose playing has become the signature sound of modern-day Ubu) there remains a sharp focus and restless pace that makes for an exciting, enthralling opening set. Returning after a brief break for their ‘professional’ set, the music gets more structured and direct but no less intriguing. Leaning heavily on recent albums Lady From Shanghai and Carnival of Souls whilst avoiding their seventies and eighties work entirely, it’s far from crowd-pleasing, but their performance tonight makes a compelling argument for their continued relevance. 414 Seconds is a sinister marvel, while Carnival and the bleak beauty of Irene make the case for Carnival of Souls just fine. Older material like Memphis from 1995’s Ray Gun Suitcase (one of the very few successful attempts at pressing the musical reset button out there) only proves the outstanding continuity and consistency of their work, both in and out of the limelight. The only sour note of the night comes from David Thomas’s constant berating of the sound man – needless to say, the sound out front is superb all night – although his superb, ever-idiosyncratic vocal performances and wry, deconstructionist humour keep him in the audience’s good books. Closing on the got-the-joke-yet lurch of Buy More Merch, Ubu even do their best to collapse even their own remarkable performance on itself so as to have the last word on rock music once again. Thankfully for us, they don’t quite succeed, the good ship Ubu departing to continue its strange, delirious voyage.